Dr. Neil J. Zemmel discusses the advantages of full and mini abdominoplasty procedures – two of the most popular body contouring treatments he performs at Richmond Aesthetic Surgery. Richmond, VA — For many patients of Neil J. Zemmel, MD, excess skin and fat around the abdomen is a serious cosmetic concern. According to the Richmond plastic surgeon, redundant skin and fat that builds up in front of the abdominal wall can often be difficult to eliminate with diet and exercise alone, even for extremely active individuals. At Richmond Aesthetic Surgery, Dr. Zemmel offers full tummy tuck surgery (abdominoplasty) and mini tummy tuck surgery, both of which are designed to remove excess skin and tighten the stomach region for a more toned figure. With their ability to be combined with liposuction for localized fat removal, he notes that these procedures can be particularly beneficial for men and women who have undergone significant weight loss but still have loose, redundant skin and remaining pockets of isolated fat in and around the midsection. In addition, he says women who have had difficulty returning their bodies to their pre-pregnancy shape can also greatly benefit from abdominoplasty. Dr. Zemmel highlights that abdominoplasty does more than simply remove excess skin and tighten remaining tissues around the stomach. During the procedure, he explains that the underlying muscles of the abdomen are also tightened to achieve a rejuvenated silhouette that often cannot be accomplished by any amount of diet or exercise. This muscle tightening can be essential for women trying to slim and tone this area of the body after having one or more children, as these muscles are often stretched or torn during pregnancy, says Dr. Zemmel. 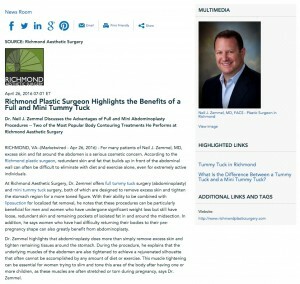 When explaining the differences between a full abdominoplasty and a mini tummy tuck, the Richmond plastic surgeon notes: “A mini tummy tuck improves the area below the belly button, removing excess skin and tightening the rectus muscles at this level.” He goes on to say that though this abbreviated procedure typically involves a smaller incision and a shorter recovery period, the results of a mini tummy tuck are often limited when compared to a full abdominoplasty, which targets concerns both above and below the bellybutton. As a result, for patients whose excess skin and fat is not limited to the lower abdominal region, Dr. Zemmel notes a traditional full tummy tuck may be a better choice to suit their needs. Ultimately, Dr. Zemmel stresses that the best way to determine which body contouring procedure can meet an individual’s expectations is to schedule a consultation with an experienced, board-certified plastic surgeon. By doing so, he states that the safest, most effective technique can be selected based on the patient’s specific needs and goals. Dr. Zemmel is a Diplomate of the American Board of Plastic Surgery and the head of Richmond Aesthetic Surgery. In addition to serving as an active member of the American Society for Aesthetic Plastic Surgery and the American Society of Plastic Surgeons, he is a Fellow of the American College of Surgeons, as well as a member of the Medical Society of Virginia. Dr. Zemmel offers a number of advanced surgical and non-surgical cosmetic enhancement procedures for the breasts, body, face, and skin. He is available for interview upon request. For more information about Dr. Zemmel and Richmond Aesthetic Surgery, visit richmondplasticsurgery.com, vabreastsurgery.com, and plus.google.com/109479035144616950506/about.